Global markets are looking resilient after early falls Monday following a series of coordinated terrorist attacks in Paris that left at least 129 people dead. 1. Paris in mourning: The Euronext Paris stock exchange opened this morning with added security measures in place. The key Parisian index -- the CAC 40 -- initially dropped by about 1% but then recovered and was little changed in late morning. Most other European stock markets were narrowly positive, reversing early losses. But European airline and tourism companies are taking a big hit as investors worry that the Paris attacks will scare people away. Shares in the parent company of Air France are dropping by about 5%. Shares in the French hotel group Accor (ACCYY) are also declining by about 5%. The euro is also declining against all major global currencies, including the U.S. dollar. It's currently trading around $1.07. 2. 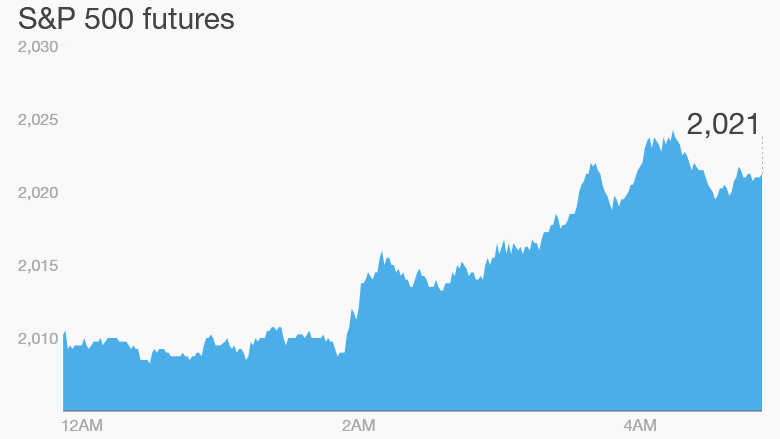 U.S. stands in solidarity: U.S. stock futures are edging higher ahead of the open. The New York Stock Exchange will observe a moment of silence at 9:25 a.m. ET in honor of the victims of the Paris attack. Travel companies including TripAdvisor (TRIP), American Airlines (AAL) and Delta Air Lines (DAL) are dipping premarket, though the moves down are modest. 3. Japan back in recession: The Japanese economy has dipped back into a recession, again. Gross domestic product contracted by an annualized 0.8% in the third quarter. The economy also shrank in the previous quarter. The Nikkei in Tokyo fell around 1% Monday. Many other Asian markets ended the day with losses, though the China Shenzhen index rallied by 2%. 4. Earnings: Chinese e-commerce site JD.com (JD) and retailer Dillard's (DDS) are among a handful of companies that are reporting earnings ahead of the open. Urban Outfitters (URBN) is expected to report after the close. It's worth noting that retailers have been a major weak spot in the U.S. economy lately and many have been reporting disappointing quarterly results. 5. Weekly market recap: The mood in the markets was sour last week. The Dow Jones industrial average dropped 3.7%, the S&P 500 declined by 3.6% and the Nasdaq tumbled by 4.3%. Investors were selling as they worry that the Federal Reserve will hike interest rates next month.